How's everyone doing today? I'm trying to get over the post vacation hump! It's hard to get back into the swing of things with work and kids and the like. Slowly things are resuming there normal schedule and I'm getting back into my craft room. 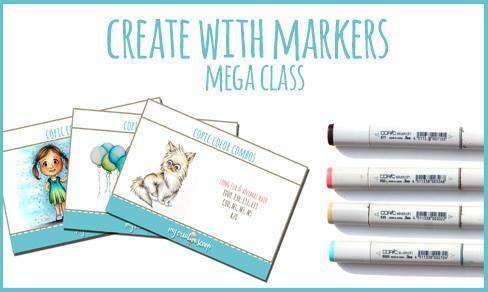 I have finally had the chance to finish the last sections of the Create with Markers Mega class! I have been working my way through section by section. Mindy at My Creative Scoop breaks everything down into differenct sections. It makes it a lot easier when you don't always have a lot of time to devote in one sitting. The last portion deals with wood/leaves/greenery. I should have printed out the digital stamp a little bit larger but I made it work anyways. I think it would have been easier to squeeze in some more wood grain texture but there is always next time. I turned the completed piece into a very simple card. After I spend all that time coloring an image I really want to keep it as the focus. 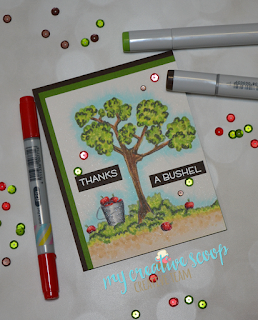 This sentiment is from the Thanks a Bushel set by Lawn Fawn. It was the perfect sentiment! I stamped it onto dark brown cardstock and embossed it with white embossing powder. I cut the main piece down a little bit, adhered it to a green layer and then onto the brown card base. It is the same dark brown that I used on the sentiments. I gathered up a couple diffrent sequins to coordinate and called it done! 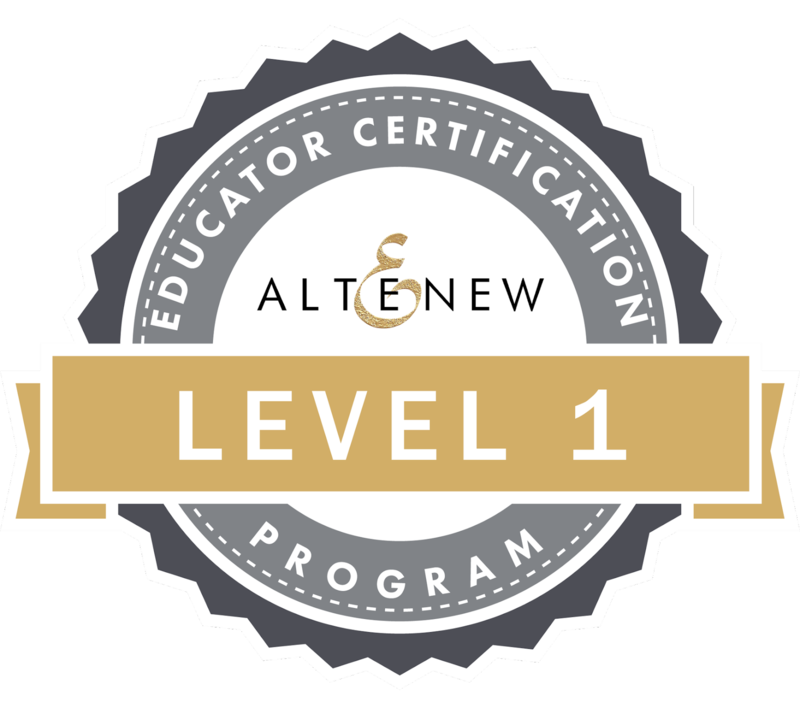 If you haven't checked out Mindy's classes yet, you can follow this link to all her current offerings. She recently added an amazing hair and skin class! It is on my wish list but it will have to wait. I just signed up to take her Creating Backgrounds with Markers class. I can't wait! Hiya my crafting friends! 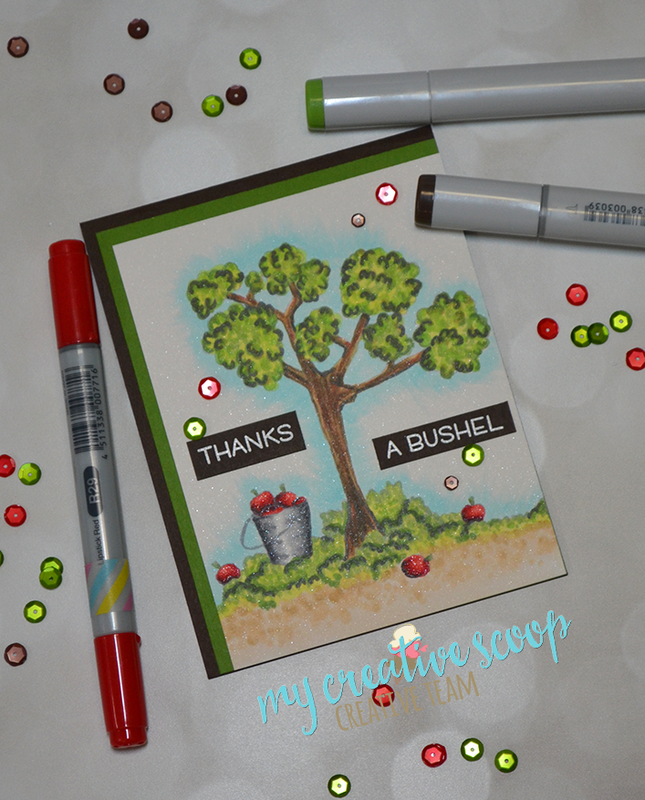 I'm back today to share a card that I made out of a practice piece I colored in Mindy Baxter's Copic Create with Markers Mega class. Check it out here. I have been having a great time with the class. I had to take a short break due to a family vacation but I plan to be back at it again shortly. I think I'm down to the last couple of sections (trees, grass, etc.). Then I hope to take her Creating with Backrgrounds class! I love learning more and more about using my Copic markers. I am always looking to improve my skills. I highly recommend you check her classes out. She even has a free class to try out! I am amazed at how simple she makes it seem! I was able to follow her instructions to achieve beautiful results the very first time I colored the image. I just love how it turned out. I can see myself coloring a lot more balloons in my future. The gray layer is Going Gray cardstock from Stampin Up. The blue layer is Pacific Point also from Stampin Up. I used the Roses all over background stamp from MFT Stamps and embossed it with white embossing powder. The aqua layer is Cool Caribbean from Stampin Up. 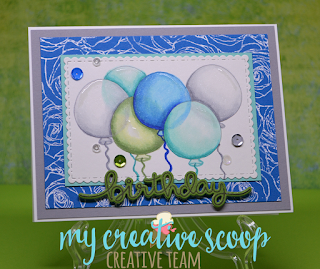 The balloon layer was cut using a die from the Fancy Frames set from Craftin Desert Divas. I did add a little glossy accents for a little extra highlight. The sequins are from my stash (most likely from Pretty Pink Posh). 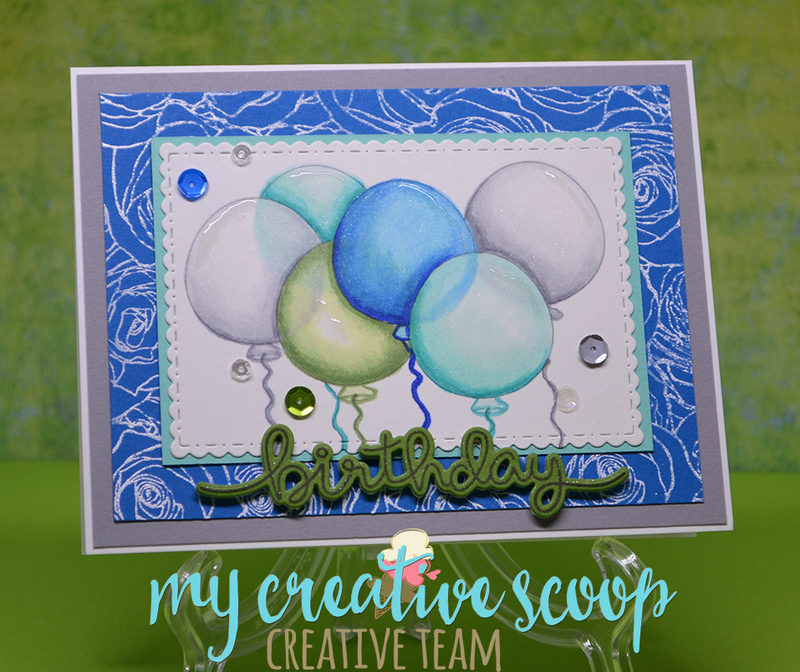 The birthday die and stamp are from Lawn Fawn. I appreciate you stopping by! Remember to check out Mindy's full line of classes here.